Once again I find myself looking back at all the time that has slipped past me… Should I be getting used to this? 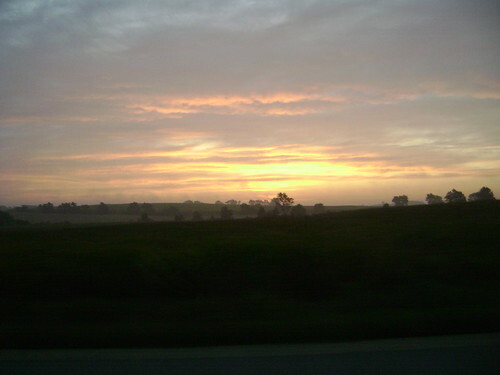 Sunday morning I awoke at 4am to join my Mum, sister and her husband for the Elkhorn Flea Market. We were through the gates just after they opened at 7am. 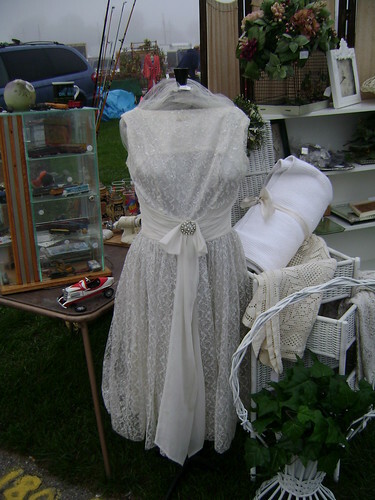 I saw this dress and thought about having a vintage and antique wedding. Matt and I have a lot of talking to do about preplanning and such even before we start the actual planning of the big event. I snapped a picture since I loved this dress and documenting ideas and inspirations has to be a good thing. always. The same booth had a gorgeous quilt for sale. I bought it for $8 and we continued on our adventure. We misplaced each other but that is common during our Elkhorn Flea Market adventures. Mom and I would some how wander ahead of Andy and Jenn but then in the next moment only I am straggling behind looking at something that caught my eye. In the end we all climbed back into the truck with our scores in the back. You may be wondering why I bought the Ziploc bag of vintage sewing notions. Take a closer look at that bag. 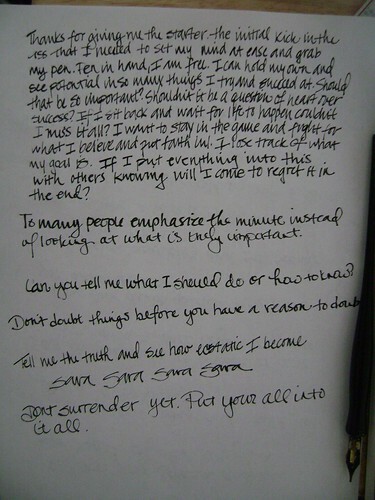 Do you see the blue pen? The blue Esterbrook fountain pen? I was lucky and caught site of that gorgeous needle in the haystack while walking through a random booth. I made a squee noise, opened the bag and checked out the pen. Nib was intact and looked good, the lever moved and the sac didn’t make any crunchy sound. The pen body and cap were in good condition and both “jewels” are there and beautiful. I asked if I could purchase just the pen but they said it was a package deal. So for $2 the pen and bag of goodies joined the ranks of my purchases with the quilt. 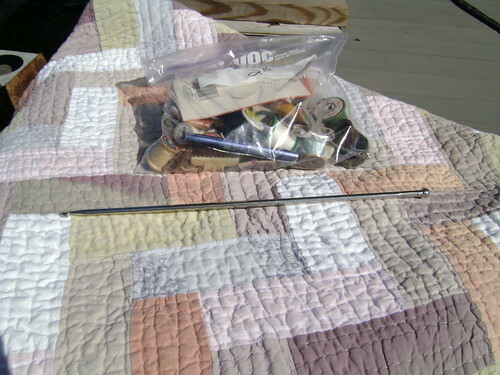 The last item is my first Tunisian crochet hook. Mum bought it for a dollar just for me under the conditions I show her how it is used when I start my first Tunisian crochet project. Deal! 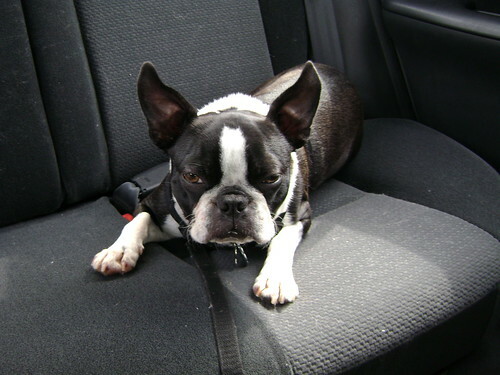 Matt and I were more than happy to take Iggy Pup to Lake Geneva on Saturday followed by a stop at Burlington’s dog park. He was exhausted but fought sleep like a trooper. Now it is my turn to fight sleep and watch some tele before relinquishing control of my mind to the dreamer in me. I’ve been a bad blogger again. Too long has passed in between posts and I regret to inform you that this post will be less than it should be. I wanted to sit down and type up the best post for you all but find myself feeling rather “blah” today. I splurged on a Lamy Alstar via EBay. It has joined the ranks of my arsenal along with a bunch of the blue cartridges. I love this pen. I think. I mean I need to spend some serious time with it. 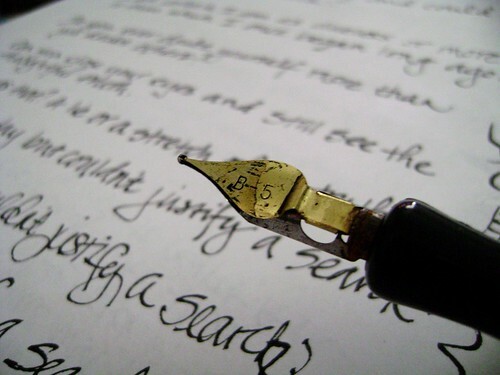 My sporadic tendinitis makes it hard for me to judge new writing instruments some days. I’ll take another closer and more thoughtful look at it and write up a proper review in the future. Until the review, please enjoy the pen pr0n. 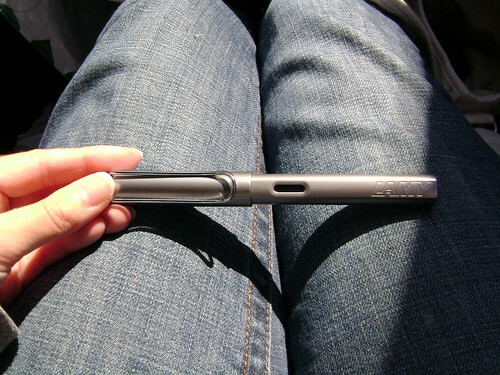 It has a medium nib and is loaded with the Lamy blue ink. It did not come with a converter which I might rectify. At first I did not care for the Lamy blue ink but the more I look at it, the more I like it. Behold my very first Esterbrook. Isn’t it marvelous? I am so in love with the copper color. The sun really sets off the depth and rich tones. I cannot thank Mary enough for her generosity and kindness! I haven’t done much art lately and it depresses me. 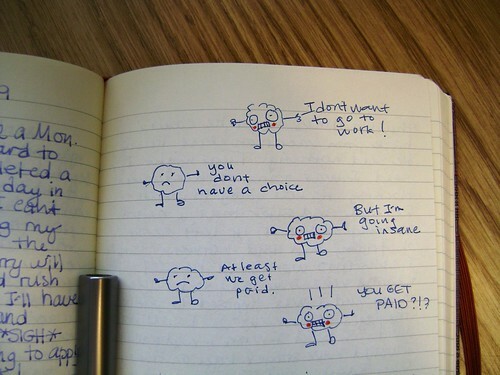 This doodle may hold a clue as to why my creativity pools have run dry. 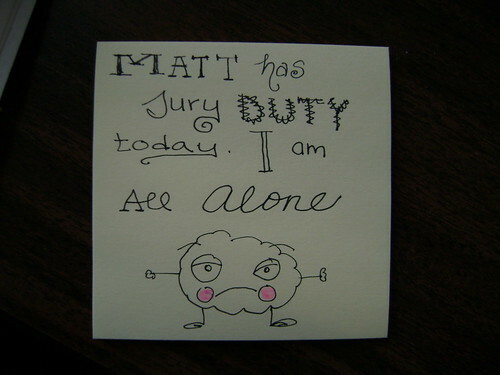 Matt was on jury duty this past week only to discover Thursday that he wasn’t really on jury duty since he moved to a different county. We were only apart for a total of 3 hours but I didn’t know that when I doodled on this sticky note. I am totally in love with Gemma Correll. She does amazing illustration art. I think her daily diary and “what i wore today” are tied for my favorite. I gave my hand at drawing my Saturday. Do you like it? I used my Staedtler Fineliners. 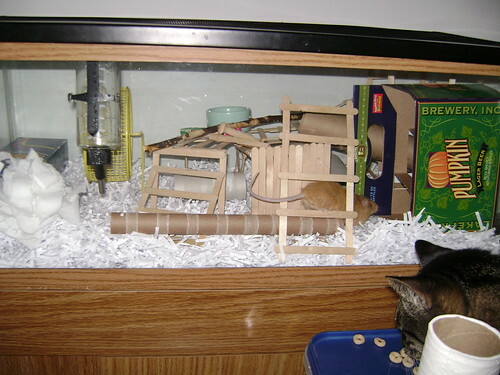 You may have noticed that I adore my pets. Sundays are tank cleaning days for Ripley. I promise he is a mouse – most people don’t believe it because of his texel (curly) coat and large size. I have so much fun filling his tank with goodies. 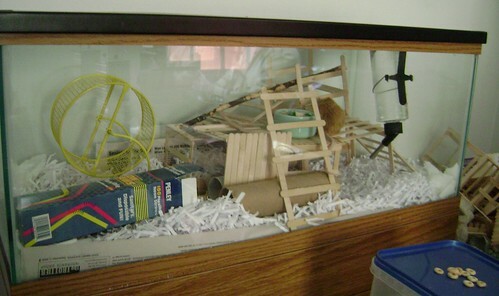 The first tank shot is last Sunday’s arrangement followed by his setup for today. 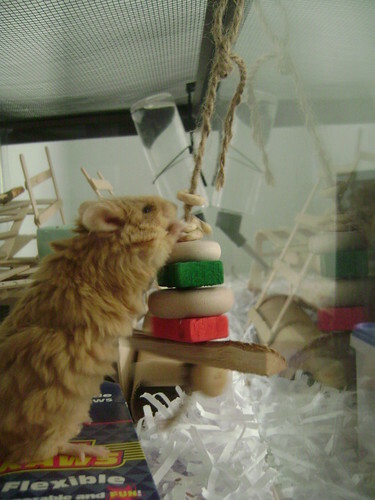 Ripley has a thing for Cheerios but then if you look at the tank picture from today, so does Toby. That’s his big kitty head stealing all of Ripley’s Cheerios. I guess if it is a treat for Ripley, it has to be a Toby treat too. 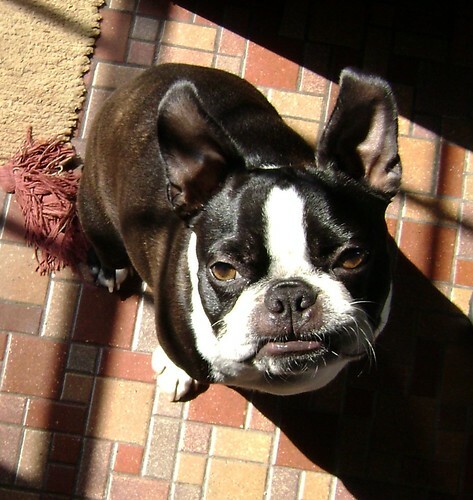 I’m hoping that ending with a picture of Iggy Pup will make up for my absence. His pouty face destroys my defenses every time. Can you stand up to this face? Busy days have become commonplace. I picked out yarn for a baby blanket I am making for my coworker. (It’s actually for the lil bun in her oven). It is Caron Simply Soft in “Soft Blue”. The yarn is so silky and I hope the perfect match for a lil baby boy. I picked a stitch out of the awesome stitch book Matt got me for my birthday: The Harmony Guides: Basic Crochet Stitches. The “Single Crochet Cluster Stitch I” looked like it would be a good baby blanket stitch since it lacked holes for baby fingers to get snagged on. It didn’t look bad but I was having a rough time getting used to the pattern. I just wasn’t “feeling” this project so after a couple weeks, I gave up on it and frogged it after a discussion with my mum. Frogging is a depressing yet invigorating act for me… Unraveling progress into raw material was the right choice! 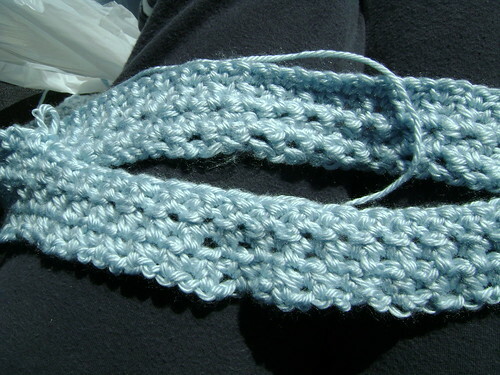 I began again using the “Single Crochet Cluster Stitch II”. This pattern was much easier for me to follow and I got into the rhythm right away. I’m now looking forward to working on this blanket and don’t need to have the open book in front of me at all times to verify my stitches. Progress is a beautiful thing! I like the way this stitch looks, the texture and pattern is coming out so nicely! 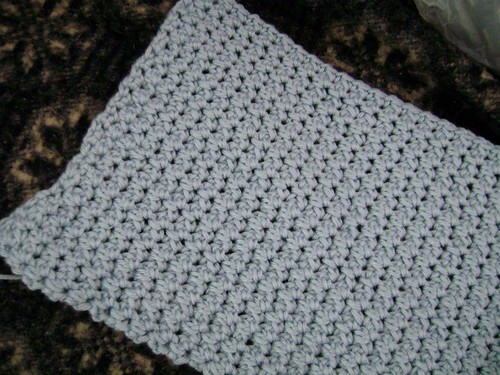 Do you like it for a baby boy blanket? I feel like other than crochet, my art has slipped to the side again. 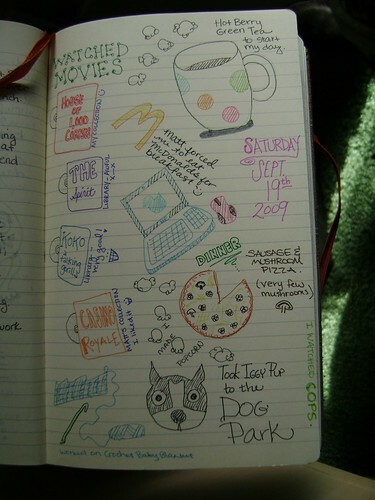 I haven’t been journaling or blogging regularly. On a positive note – I have acquired three new bottles of fountain pen ink. Sunday I had to get out my dip pen and nibs to give the colors a look-see. 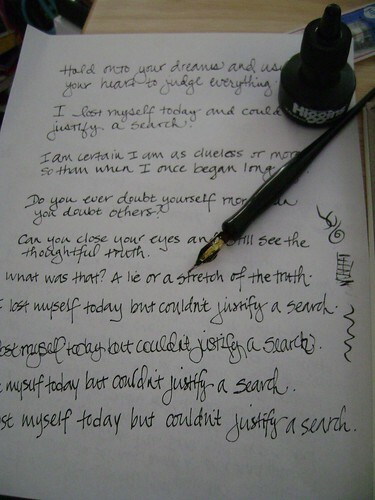 I ended up uncapping my black india ink and playing with my Speedball B-5 nib. The nibs n pens are from my father’s collection and they hold a special place in my heart because of that. I love thinking that my dad used to draw and create with these same tools. 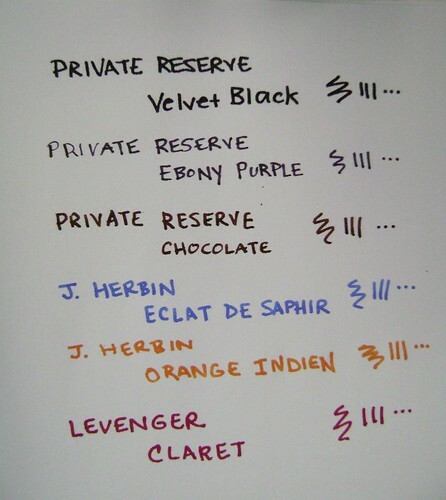 I have a grand total of six bottles of fountain pen ink now. I suppose every collection has to start small. I am loving all the colors which is my favorite part. I spent all of August abiding my by “no unnecessary spending” vow. 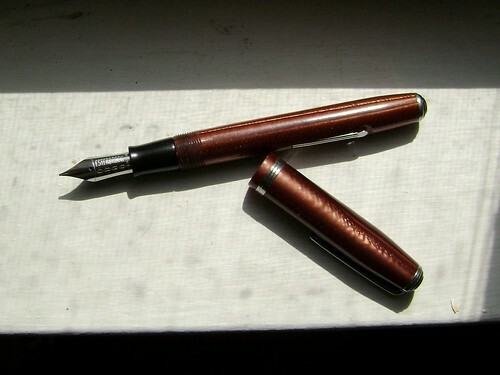 I did very well and rewarded myself with the purchase of a Lamy fountain pen off of eBay. :squeee:! I can’t have more bottles of ink than I have fountain pens, can I? Speaking of my addictions, I saw a fancy new notebook at Walgreens. 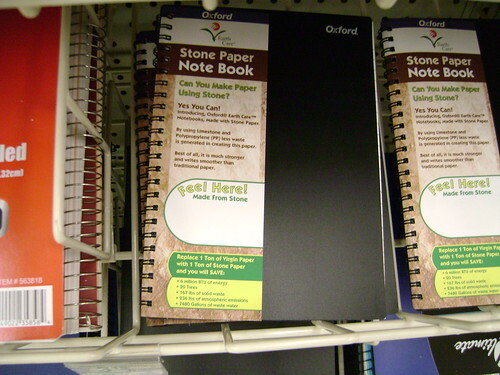 It is Oxford brand Stone Paper Note Book. It appears the crew over at DIYPlanner already knew about it and there is a post here. I didn’t buy it because of my spending cap but I did take some time touching the unusual smooth plastic-like-feel paper. Maybe if I finish off a few notebooks, I’ll splurge on it. I believe it was around $3.50 at my local store if you were curious. This morning Matt left very early so I got up much earlier than I had planned. I think it was 6:30am. Iggy Pup sleeps in bed with us and was snoring heavily when I got up. I couldn’t justify disturbing his sleep. I use his sleeping-in time to cuddle with my kitties and get things done around the house. (Yes he tends to sleep in a lot!) I figured that around 8am he would want to get up and start his day with a nice walk or at least a potty break. 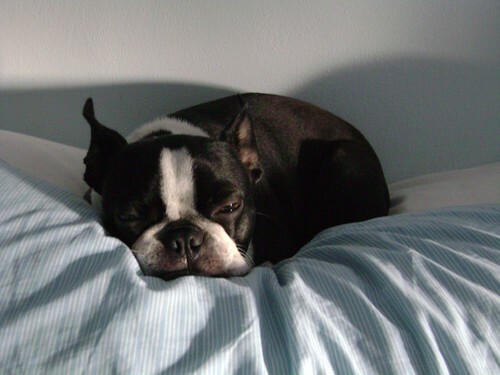 I walked into the bedroom to find the lil puppy prince on my pillow! How can I not adore this puppy with all my heart – look at that face!